I was a bit scared since it was my first attempt at an upside-down cake but it turned out great. For the fruits, I was fixed on using peaches and plums. To pair with them I used my go-to white cake recipe. For making the caramelized fruit topping, I used the instructions as well as tips shared here. It baked beautifully and didn’t even trouble me while de-molding. I was worried about the cake sticking completely to the pan, about fruits not really working out well or family members not liking it. Well, I was worried about everything. All my apprehensions were unfounded, the cake was a magic. It was sticky with decadent topping, a heavenly mouthful. My aunt loved it so much, she took repeat helpings (psstt… who’s counting?). She later asked me to share the recipe as well. My mother also liked the tanginess of fruits a lot. I love fruits in my bake so for me it was a winner hands down. I served it with ice-cream, you can serve it slightly warm or with whipped cream. 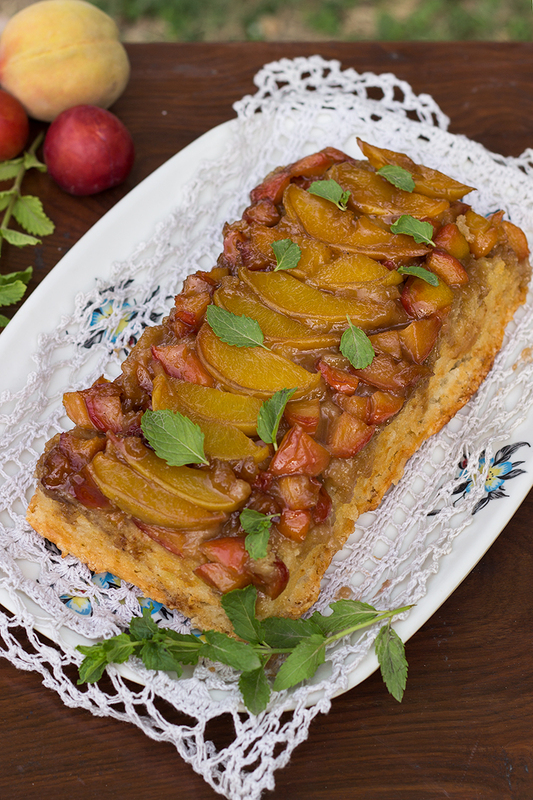 The sweetness and juice of peaches work very well with tartness of plums.